Saponins are a large group of glycosides present in many plant species. They exhibit high surface activity, which arises from a hydrophobic scaffold of triterpenoid or steroid groups and attached hydrophilic saccharide chains. The diversity of molecular structures, present in various plants, gives rise to a rich variety of physicochemical properties and biological activity and results in a wide range of applications in foods, cosmetics, medicine, and several other industrial sectors. 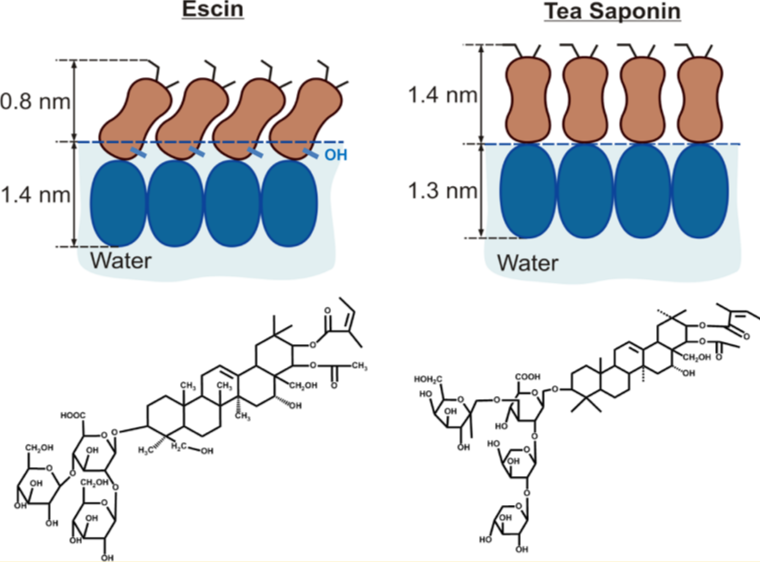 Saponin surface activity is a key property in such applications and here the adsorption of three triterpenoid saponins, escin, tea saponins, and Quillaja saponin, is studied at the air−water interface by neutron reflectivity and surface tension. All these saponins form adsorption layers with very high surface visco-elasticity. The structure of the adsorbed layers has been determined from the neutron reflectivity data and is related to the molecular structure of the saponins. The results indicate that the structure of the saturated adsorption layers is governed by densely packed hydrophilic saccharide groups. The tight molecular packing and the strong hydrogen bonds between the neighboring saccharide groups are the main reasons for the unusual rheological properties of the saponin adsorption layers.